Honda Goldwings have been manufactured for roughly 40 years. Over 600,00 have been sold mostly in the United States. A very popular model, but challenging to mount your GPS, smartphone, or whatever gadget you have to your bike. Earlier versions had a handlebar. Today, we discuss mounts for Honda Goldwing motorcycles. A Honda Goldwing has some unique mounting challenges due to a lack of the traditional handlebar. Therefore most mounting solutions will use a different location. Roughly 20 years later, Honda’s design change removed the majority of real estate away from the handlebar on the Honda Goldwing. While it looks better, it diminished the ability to mount your stuff (not that Honda really cares about that point). Mounts in other places are needed. I have read many a post and spoken to several Goldwing riders that have used adhesive or bungee cords. There are certain adhesives that will hold quite tightly and not compromise from the vibrations of a motorcycle, but there are also many adhesives that will fail. Unless you are a chemist or manufacturer specializing in adhesives and know it will withstand extreme vibrations, I don’t recommend using them on motorcycles (but if you do decide to do it, be sure you are using 3M VHB adhesive). And avoid a bungee cord. The issue with a bungee is that they wrap around the device and block part of the display. I suppose that doesn’t matter greatly for an Apple iPod, but if it’s a GPS, that isn’t going to work well. Fortunately there are a few companies that figured out some good locations for mount points on a Honda Goldwing. The clutch/brake reservoir is an excellent location. The bolts can be used to hold mounting solutions specifically designed to fit a Goldwing (turns out most Harley Davidson models have similar dimensions so most of what we talk about applies there as well). 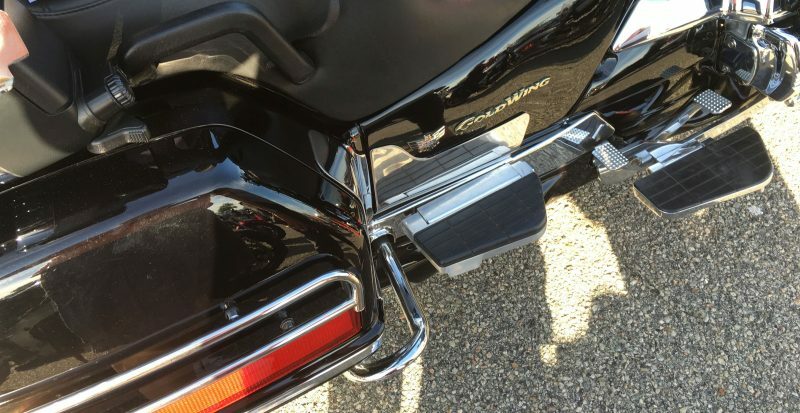 We are familiar with two proven manufacturers of mounts to fit the Goldwing. Our recommendations apply to almost all Goldwing models including the popular GL1800 and GL1500. Techmount, based in the United States, manufactures the Techmount Control Mount Kit featuring a 17mm ball at the end. Ironically (or maybe not ironically) that’s the same size ball that Garmin uses for the back of their GPS cradles. This part comes with stainless steel bolts that will replace the current manufacturer bolts. These bolts are somewhat similar to the manufacturer set with the exception they are longer to accommodate the added depth of the mount. You can then add your Garmin cradle to the 17mm ball. If you would like to mount a phone, you can add the Techmount TechGripper to the mount. There are also several inexpensive adapters that permit the installation of cameras such as the Techmount GoPro Camera Adapter for the popular GoPro series of action cameras. RAM Mount, also based in the United States, has an extensive array of mounts that fit the brake/clutch reservoir. All made of metal, most mounts will feature the RAM Mount Motorcycle Brake/Clutch Reservoir Base. This part is somewhat similar to the Techmount entry in that it will attach using some newly supplied bolts that take the place of the manufacturer set. The one inch ball at the end of the mount will then connect to various arm sizes and lastly a custom or universal cradle. If starting out fresh with RAM Mounts consider the Ram Mount Double Ball Brake/Clutch Reservoir Mount as it includes everything you need except the cradle. RAM manufactures a variety of custom GPS cradles to fit this kit. For a smartphone, we are fans of the X-Grip line of holders. We have written extensively about the X-Grip line of cradles and you may read our detailed article here. The RAM Mount Universal X-Grip Holder is what I like to recommend for most smartphones. it opens to 3.25 inches. RAM now throws a safety tether with these X-Grip mounts which is a nice added feature to keep your phone secure so be sure to get one that’s recently packaged to make sure you get the tether.